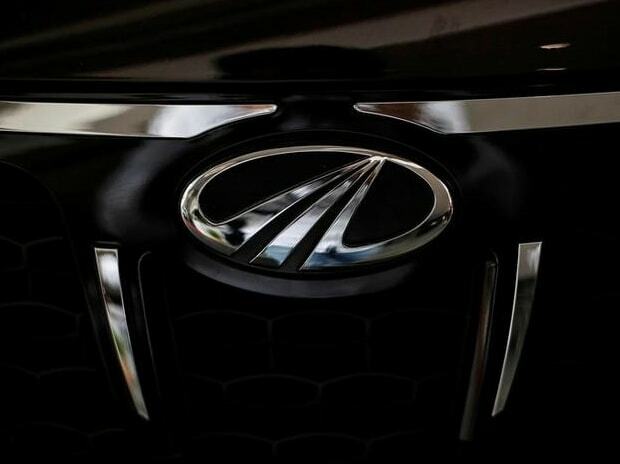 Mahindra & Mahindra’s (M&M’s) March quarter (Q4) performance was along similar lines of previous quarters with the tractor business showing strong volume growth and gaining market share, while the utility vehicle (UV) business struggled despite the industry growing at a robust pace. Driven by a 15.5 per cent year-on-year (y-o-y) growth in tractors and higher realisations, revenues grew 4.3 per cent to Rs 10,612 crore, which was better than consensus estimates which pegged it at Rs 10,573 crore. Despite the fall in volumes in the segment by 1.8 per cent, the company managed to improve its revenues in the segment due to higher realisations. 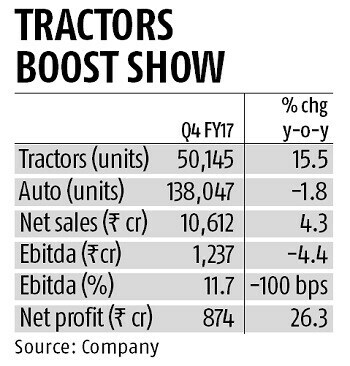 While profit for the auto segment before interest and tax fell 24 per cent, those in the tractor segment improved by 30 per cent due to operating leverage as well as cost efficiencies. Overall operating profit margins for the quarter came in at 11.7 per cent which was 100 basis points lower than the year-ago quarter. The company indicated the impact of unsold BS-III inventory and lack of excise benefits at the Haridwar plant dented the operating performance. Adjusted for the Rs 171-crore impact due to BS-III, margins, according to the company, would have been higher at 13.2 per cent, up 50 basis points over the year-ago quarter. Reported net profit was up 26.3 per cent due to higher other income at Rs 294 crore and one-time exceptional gains of Rs 94 crore. Despite the slowdown due to demonetisation, a favourable monsoon led to improvement in tractor demand for FY17. The company ended FY17 gaining 1.8 per cent market share to 43 per cent. The management expects tractor growth for the current financial year to be 10-12 per cent, driven by good monsoons and a pick-up in rural growth. Analysts expect the sector to end FY18 at volumes over 6.35 lakh units, last seen in FY14. This augurs well for the market leader as well as the tractor segment’s margins at over 17 per cent are much higher compared to the auto segment’s margins at 7.1 per cent. Going ahead, the company expects passenger vehicle growth to be at 8-10 per cent while that for UVs is expected to be at 10-12 per cent in FY18. Given that the company’s UV volumes were flat y-o-y and the sector grew at 30 per cent in FY17, M&M’s market share has shrunk by over 700 basis points to 30 per cent. The company continues to lose ground to rivals as the trend of lower UV sales continues with April volumes down 15 per cent y-o-y. To arrest the decline in market share, the company has lined up new launches and refreshes during the year. A lot will depend on the response to multi-purpose vehicle called U321, to be launched later this year.